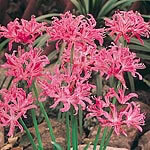 At the end of the summer, just as many flowers are coming to an end, nerines will surprise you with an explosive display of vibrantly coloured sparkler-like blooms. Ideal for cutting and they'll last for two weeks in a vase of water! Magenta pink. Flowers September-October. Height 35cm (14). We are not normally able to accept orders for tubers after mid April. For BEST VALUE, Pick and Mix any 4 or more packs and get the cheapest pack FREE! - excluding Lily pollen-free Collection. See photos of Nerine bowdenii in real gardens.